This location agrees with the information from the patent. We have located the focal point in object space. This is our first piece of new information since the patent does not specify the location of this focal point. The front focal point is useful to close-up photographers because it determines magnification when a lens in reversed. In our figures I will use blue to indicate rays from object space and red to indicate ray from image space. The rays on the edges (margins) of the ray bundles are called marginal rays. Note that I'm following the color convention for the point labels as well as the normal convention of using an apostrophe (prime) to indicate image space values. Here are some specific observations regarding this lens. The blue marginal rays are limited by the aperture stop; this is expected. 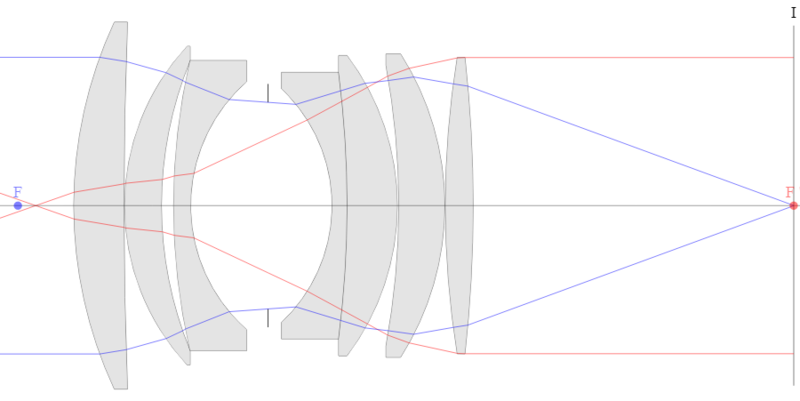 But the red marginal rays are limited by the rear element of the lens. When this happens it is called a field stop. It's not unusual for some element in the rear of the lens to act as a field stop for rays coming in from the image side.